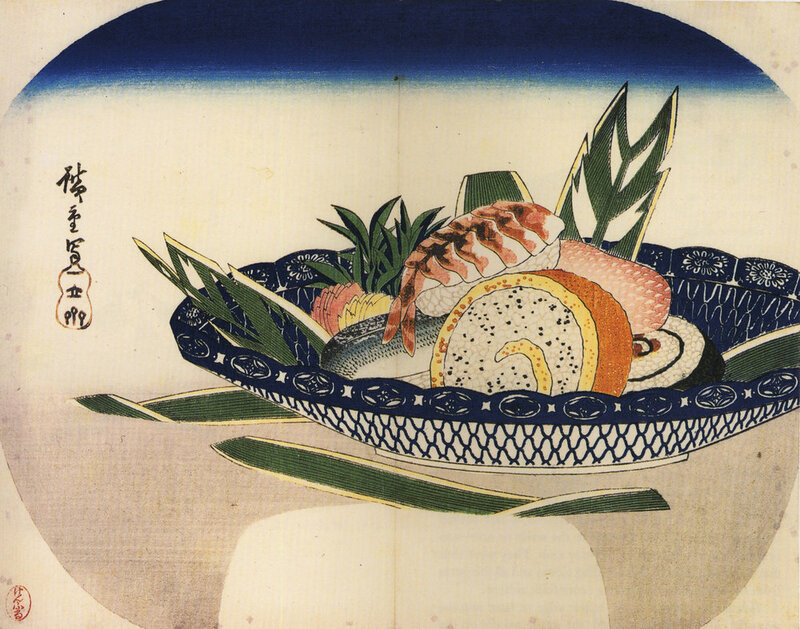 Hanaya Yohei (1799–1858) is widely credited as the inventor of Edomae-zushi. Born in Fukui prefecture, Yohei arrived in Edo in 1818. Wanting to serve sushi without long preparation times, he developed the nigiri-zushi method: sliced neta (raw, marinated, simmered, and/or salted, depending on the neta) are placed directly on top of vinegared rice balls, and hand-molded (squeezed) together at once. This new preparation method was a revelation. In the past, sushi had been fermented for several months (a style called narezushi) and the dominant flavor profile came from this long fermentation process. Now, various neta flavors were able to shine alongside the freshly cooked & vinegared rice. And not only was Yohei's sushi delicious, but it was also fast, allowing for busy Edo workers to order whatever neta tickled their fancy, and eat it on the run, as a sort of fast food. Yohei developed this new nigiri-zushi around 1824, and, as the story goes, first sold it from a box that he carried on his back. As he became more and more successful, he moved his operation to a stand, before eventually opening a restaurant (called Yohei Zushi and located in the Ryogoku area of present-day Tokyo) which remained in operation until 1932.